There’s no question that women face beauty standards in ways that most men don’t have to deal with. But that doesn’t mean that men haven’t felt the pressures. 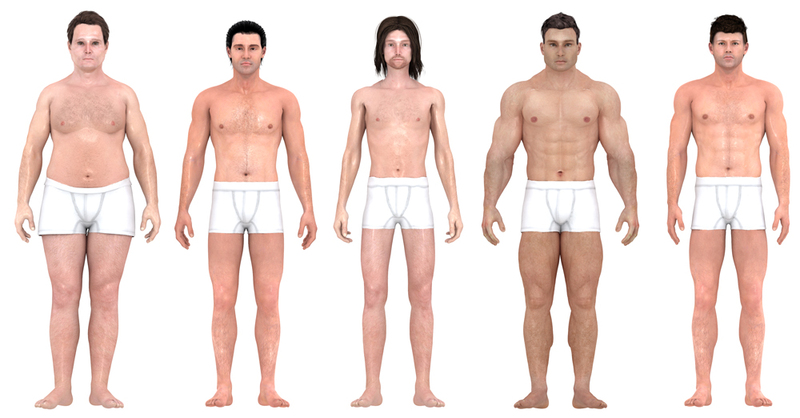 What follows is a study of how perception of the men’s “perfect body” has changed through the years. Today, obesity is often associated with poor economic status, but before people had easy access to food, plump figures were considered attractive because they suggested upper class status. In the late 19th century, a wide waist showed that you could afford lavish feasts and was a status symbol of money. 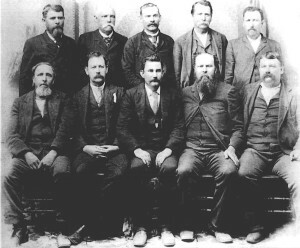 In 1866, a Fat Man’s Club was founded in Connecticut and and spread throughout the country. The requirement? You must weight at least 200 lbs. The Fat Man’s Club ended in 1903 as America was becoming less fond of the overweight body type. Access to food was becoming easier. A wave of incoming immigrants, who were perceived as overweight and lower class, fueled xenophobia in a predominantly white population. By the 1930s Hollywood presented a youthful, fit ideal. Actors needed to be slim for cameras, which automatically added perceived weight. In 1940 William H. Sheldon, PhD, MD, a Harvard psychologist, introduced the concept of body types. According to him, the ideal body type was the muscular mesomorph to which he attached nearly all positive personality traits, without any data or experimentation. Hollywood represented the v-shaped muscular mesomorph, but not nearly to the extent that modern cinema does. On the bodybuilding front, Charles Atlas, the precursor to Arnold Schwarzenneger, founded Charles Atlas Ltd. in 1929 to sell his exercising methods. His “world’s most perfectly developed” body was however, very different from the body that became “ideal” in the 1980s. Between 1945 and 1960 America achieved rapid economic growth. During this era, a man’s identity was tied to his job. To get ahead in the corporate workplace, features like height were considered beneficial by Vance Packard, in his book, The Pyramid Climbers. A crew cut was the haircut of choice, and angular facial features were preferred, according to the Merton System of Face-Reading. Still, according to Lynne Luciano in her book Looking Good, the most common determinant of your access to the top of the corporate ladder laid in your looking like “the fellow next door who was assumed to be white and Anglo-Saxon,” a feature of corporate America to this day and reflected in today’s white washed popular culture. The counterculture was embraced by musicians who preached peace and love during the Vietnman War. The trend continued into the 1980s, when health clubs and working out became even more popular, and skimpy clothes began to accentuate the body. Wages and job security declined in a poor economy, leading men to look for different ways of self-validation. Body building, once seen as a fringe activity, became a respectable and popular sport amongst the Me Generation. 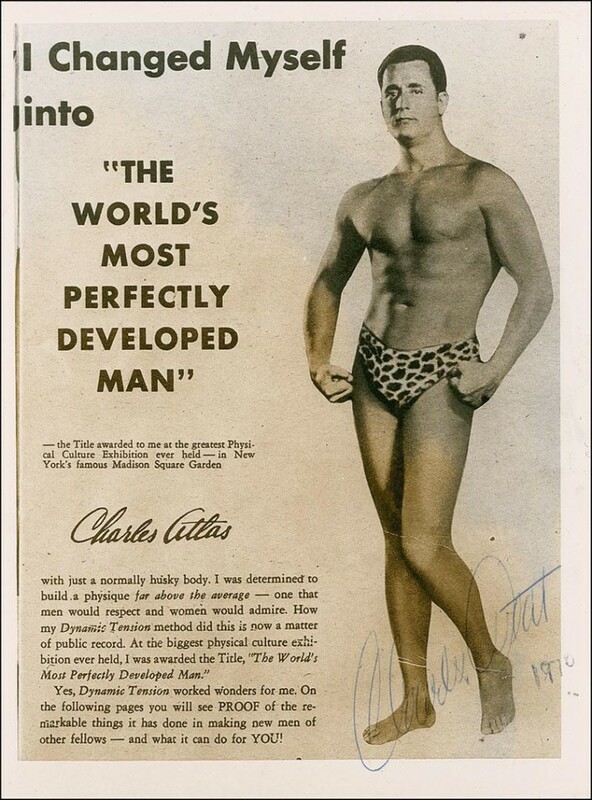 The smooth Charles Atlas look was replaced with the “cut” body: chiseled muscles and noticeable veins. The idea that you could sculpt your body and achieve personal transformation as reward is shared by the decade’s action movies, starring Arnold Schwarzenegger, Sylvester Stallone, Jean-Claude Van Damme, etc. 1990s popular culture shifted from hypermasculinity to an everyman. 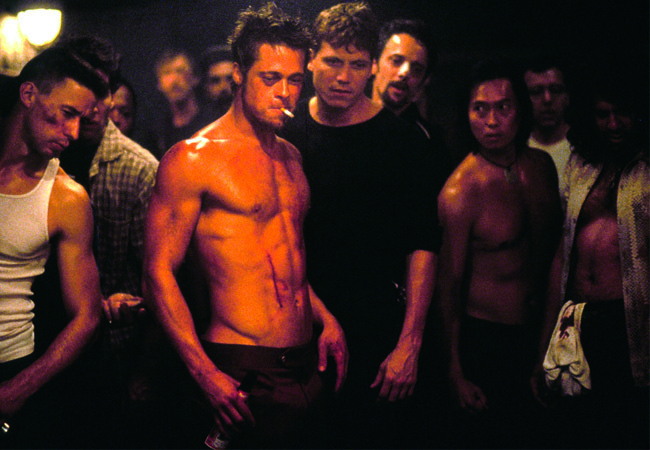 Brad Pitt’s Tyler Durden in Fight Club (1999) may have been the most influential everyman, whose not-too-muscular and lean physique, is popular to this day. In 2012, a study from the Institute of Neuroscience, Newcastle University and the Department of Psychology, University of Northumbria, used 3D visualization software to estimate male and female body preferences. The ideal male body, for both men and women, was lean and muscular, not dissimilar from the body of Brad Pitt in Fight Club. Want high resolution photos of this project? Email [email protected] and we’ll send you all the high resolution photos as well as clearance to use them. Like this story? Get more amazing stories like this delivered to your inbox once every several weeks. “HDNET MOVIES.” HDNET MOVIES. HDNET MOVIES, 5 Dec. 2013. Web. 1 Jan. 2016. Luciano, Lynne. Looking Good: Male Body Image in Modern America. New York: Hill and Wang, 2001. Print. Olesker, Max. “The Rise and Rise of the Spornosexual.” Esquire. Esquire, 12 Jan. 2015. Web. 01 Jan. 2016. <http://www.esquire.co.uk/culture/features/7588/the-rise-and-rise-of-the-spornosexual/>. Pope, Harrison, Katharine A. Phillips, and Roberto Olivardia. The Adonis Complex: The Secret Crisis of Male Body Obsession. New York: Free, 2000. Print. “What Is an Attractive Body? Using an Interactive 3D Program to Create the Ideal Body for You and Your Partner.” PLOS ONE. Piers Douglas Howe, University of Melbourne, Australia, 29 Nov. 2012. Web. 01 Jan. 2016. <http://journals.plos.org/plosone/article?id=10.1371%2Fjournal.pone.0050601>. So when will a male doll be available? How are required fields marked? In the left-to-right pic near the bottom – the one on the left is labeled 1980’s, but should be 1870’s.